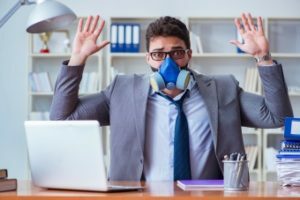 Upon entering your workplace, have you ever been greeted by a foul and pungent smell? Most of us have experienced this at least one time over the course of our careers. Sometimes coworkers don’t shower after a long exercise routine, or they simply don’t shower often, transforming their daily physical accumulation into a roaming smelly cloud. Sometimes people don’t wear socks, or they take their smelly shoes off under their desk. And sometimes people routinely forget to brush their teeth in the morning. 1. Ensure that your organization’s employee handbook has a dress code policy that specifically addresses hygiene. Setting the expectations and standards for the workplace will help guide employees to the right place vis-à-vis their personal hygiene. Other specifics of the policy could include: the use of antiperspirant or deodorant, handwashing, and avoiding wearing strong fragrances that can bother others. Not only should these expectations and standards be outlined in your organization’s employee handbook, but they should also be addressed during the employee pre-boarding and on-boarding processes. Sending out occasional reminders of the dress code and hygiene policy is a good option for helping people self-correct. 2. Don’t make the mistake of ignoring the situation. So many people (and managers) are simply too afraid to speak to a smelly coworker.